Delivers an efficient, economical use of both floor and air space. Available in popular Teardrop design (TD) "from stock". Easy to assemble, these racks pass the most scrutinizing analysis and contribute value, utility and quality. 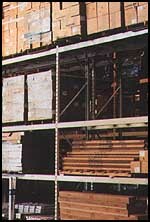 Pallet racks can easily interchange with other "tear drop" style uprights and beams.